100 Handy Google Tips for Teachers - A resource by Google for teachers, currently the list is at 171! Educators can search by tool (docs, forms...etc.) or by category (do more, save time, safety...) and Google will show how it can help. Some of the resources that come back you may have never knew existed! 100 Google Video Tutorials - Richard Byrne has produced video tutorials for over 400 tech resources on his YouTube channel. This is the link to his 100 Google specific list. He also hosts a blog called Freetech4teachers.org which educators can subscribe to a weekly newsletter or Facebook page! Google Chrome has "EXTENSIONS" and "APPS"....but what is the difference between the two? The difference for the user is where the tool is being used. Extensions are located up in the "browser bar"...see picture bellow...and are small icons that represent the tool that will run when selected. These tools will work while the user stays on the website they are currently on. As an example if you are working on a newspaper article and want to highlight text and copy it to your Evernote notebook, you could select the Evernote "extension". That tool will start and you could highlight the text you would like to save and select which notebook to place the saved text.....never leaving the website article. Chrome "APPS" are applications that have direct connections to the Chrome browser and have made it easier to select them for use. Once you have added apps to your browser you select them from the app menu by choosing the "TILE" button on the upper left of your chrome browser...or if you have a ChromeBook, the same "TILE" button on the bottom left of the ChromeBook. This will display all of your selected apps. Adding Extension and APPS : To add extensions or apps to your Chrome Browser you will need to be logged into a Gmail account. This will allow you to have all of your extensions and apps on any computer that you login with your gmail account. Open Google Chrome browser and choose the "Apps" Tile button in the upper left corner. Select the Web Store icon. There will be a search box at the left hand side of the screen. Type in the name of the extension or app you are looking for or what type of tool you want to find. 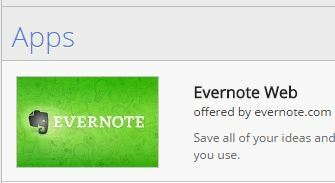 As an example we will look for the Evernote Extension. Please share feedback or report any broken links. A collaborative project of IL Classrooms in Action, Illinois State University and the Illinois State Board of Education. This site is maintained by ISBE Learning Support Specialist.